Zebraliśmy i przeanalizowaliśmy 30 ekspertów oraz 69 użytkowników z międzynarodowych źródeł. Eksperci ocenili ten produkt na 79/100 oraz użytkownicy oceniają go na 89/100. Średnia data opinii to 20-08-2018. Porównaliśmy te opinie do 1153109 opinii z innej Aparaty cyfrowe. alaSCORE™ dla tego produktu wynosi 97/100 = Wyśmienita. Ostatnia aktualizacja: 18-04-2019. In many ways the EOS M50 is the best entry-level EOS Canon has yet made. It’s a great option both for beginners and for Canon DSLR owners tempted by the advantages of mirrorless. The Canon EOS M50 is the company's first affordable camera with 4K, but there are better mirrorless options out there for video. Compact. 24MP APS-C image sensor. 10fps burst. 7.4fps with tracking. Wide focus coverage area. Vari-angle touch LCD. Mic input. EVF. Wi-Fi. 4K video is cropped with slower autofocus. Native lens options still limited. Limited shots when shooting Raw bursts. 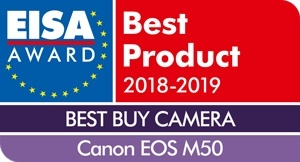 The Canon EOS M50 is a step up for the M series. It's taken time to get here, but Canon finally has a credible mirrorless APS-C camera on its hands. The updated many-point autofocus system, 4K video support and more will be welcomed by Canon mirrorless fans. This small, light and affordable mirrorless camera delivers the same image quality as its larger siblings. Thanks to the 24.